Experience the magic of dolphins up close on a 6-hour snorkel tour from Perth. 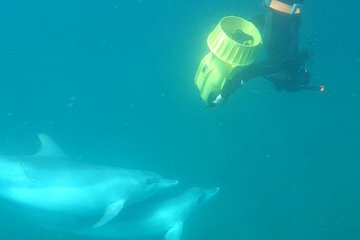 After getting fitted with a provided mask, fins, and wetsuit, you're ready to share the water with the playful sea mammals. There’s no need to worry about going hungry as lunch, snacks, and hot drinks are served on the boat. Round-trip transfer from your hotel spares you the hassle of rushing to a meeting point or organizing a return taxi during rush hour.